What Counts as Tummy Time? Most importantly, avoid forcing Tummy Time when Baby is uncomfortable. If you try these tips and Baby is still uncomfortable, you may want to seek help from a professional who has a respectful approach and may be able to discover why. Many babies benefit from support when needed! 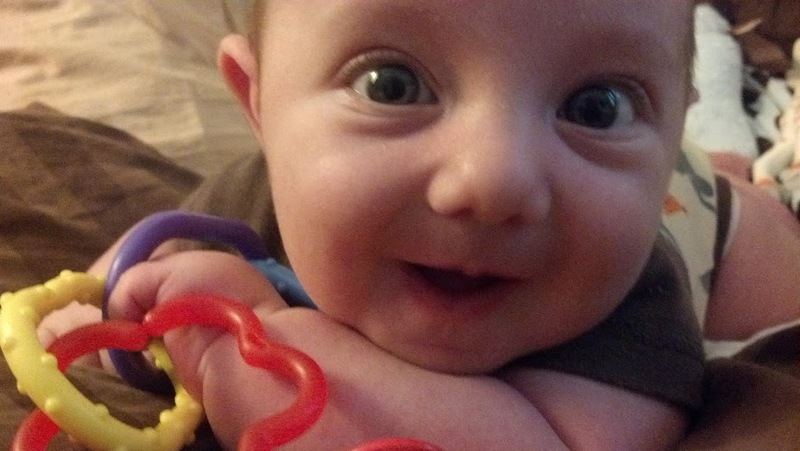 How Baby gets into and out of Tummy Time makes a difference! Use the pathway that Baby will use to get into and out of Tummy Time: roll him! Begin by holding Baby in a curved position, or a "Baby Ball." Place him like this on the floor on his side. This curled position helps avoid startling. Or, begin with Baby lying on the floor on his back. Roll slowly so that his brain and body can process what he's experiencing. This gives him a chance to see where he's going, helps reduce the startle response, and helps him know that he's not stuck. Tuck one arm down by his side or up by his head. If his face is looking toward one side, it will be easiest to roll him over the opposite arm. From here, you can either pick him up or roll him to his back. A newborn's legs are naturally bent at the hips and knees in a "frog" position. It is very important to allow this position. While we suggest that tummy time can begin at the beginning, do keep an awareness of this wisdom in Baby's body. When in Tummy Time, your newborn will still have his/her legs bent (imagine small children sleeping with their bottoms in the air!). Please avoid straightening your newborn's legs. Stay with your newborn, make sure breathing is safe, and see "What Counts" for additional options! So Baby's on her tummy, but her arm is stuck underneath her! Your loving impulse may be to pull Baby's arm out. But wait--it's an opportunity for empowerment! Try these options to help her move it herself, so that she feels she can be in control in this position and has an experience of "I can do it myself." Wait. Allow her brain to recognize what's going on. A baby’s pace is slower than ours! Gently lift her hip or shoulder (on the same side as the stuck arm). This may give her space to pull her own arm out. Gently brush your fingertips against the squished arm to help her brain "locate" the arm and direct effort there. If none of these works, bring her arm out a tiny bit and try the above again. Your baby is wise and wonderful, with an exquisite sense of what he needs! When Baby fusses or cries while on his belly, try investigating why, rather than distracting. Baby wants to tell you something! Those fusses and cries are expressions of a need, a message for help. Please honor this communication and body wisdom. If Baby protests, there’s a reason. It's a signal that something is uncomfortable and needs support, rather than that Tummy Time itself is a bad thing. Please avoid forcing. Possible solutions? Try slower; or maybe a startle response went unnoticed (it takes practice!). Perhaps he just needs to have a cry in your arms--if Baby has found Tummy Time scary, he may need to "get it out"--to release the pent up stress with the support of your listening attention. Once he tells you about it, it will likely be easier! Or it may just be an uncomfortable day and you can try again later. If distress continues, you may want to seek help from a professional who has a respectful approach and may be able to discover why Baby is uncomfortable. That said, do make it interesting! You may wish to have a toy available on the floor before you put him down; and then join him! What's the difference between this and distraction? This allows Baby to engage as he wishes in his own timing upon his own motivation, whereas intentional distraction is imposed by us and can bypass an important message his body is trying to get across. Comfort and efficient movement grow out of the ability to "yield" into gravity--to rest without tension. The youngest ones, with their elbows in close, often mouthe their fists, wriggling throughout their bodies, sometimes with their tails in the air. This helps the digestive system mature. As their heads rise higher over time, their elbows slide in under the torso, providing the structural support of bones needed underneath muscle strength. These factors influence the quality and comfort of all the milestones that will arise from being on the tummy! When propped up on a rolled towel or "bolster," it can be more difficult to find yielding, access the fists for mouthing, and get the elbows in under the shoulders. Depending on how it's done, a bolster can also encourage extension (arching) in the spine and reflexive feedback from the floor into the hands, which actually mimics pushing up on the hands. This is a later stage of development, preferably arising naturally after finding comfort lying flat on the tummy and supporting on the elbows (forearms). How a bolster is used can make a difference, of course. So while we may occasionally use a bolster, we prefer to investigate deeper reasons why the baby is uncomfortable and see if we can help build support "from the ground up." Permission granted! Enjoy this opportunity to lie on the floor with your baby. Get face to face on his level, see the world from his point of view. Go at it together! If you're there, he'll have more interest in being there. Coming down to Baby’s level builds relationship around “being” together, not just “doing” together! It lets Baby know you support her right where she is. Setting up a space: Make floor time part of your daily life so it doesn't feel like a chore or something you must do "to" Baby. Prepare a space that's comfortable and inviting, perhaps that is dedicated to floor time and doesn't need to be prepared anew every time. Make it big enough for at least Baby and you. Put a blanket down, have some pillows if wanted for the grown-ups, and bring some toys nearby. From rolling-age onward, some babies choose different movements on different surfaces (like rolling on carpet and belly crawling on the hardwood floor), so try a variety once Baby can roll safely. Bring the diaper-changing pad down on the floor too for seamless transitions! If an inviting, comfy space is there waiting for you, it will be easier to utilize! Think of Tummy Time more as a place to be, less as a thing to do. Imagine you're being held and moved face-first toward a wall or the floor. You have no way of stopping it. What would you do? How does it feel? "What's happening to me?! All systems on alert! I'm headed face-first into the floor! How will I get out of this? Stress-response system on alert, now!" A startle response is a defensive response to threatening stimuli. It serves to protect the brain/body and help us escape from trouble! This feeling of surprise and lack of control is one reason some babies dislike Tummy Time. Placing Baby directly onto his tummy is very common, but it can influence Tummy Time distress. Being brought tummy-ward to the floor can induce the startle reflex, which heightens adrenaline, pulls the arms back (so they're not available for rest or support in Tummy Time), and has the infant in a state of alarm. Then . . . Baby cries! If the startle reflex has been triggered, Tummy Time will be difficult both physically and emotionally. Rolling Baby into and out of tummy time will help. Also, watch that the head doesn't fall backwards. Maintaining Baby in a curled ball will help too. Be prepared for some frustration–it often goes hand-in-hand with motivation! Some frustration is normal, especially around pre-belly-crawling time (typically, but not always, between 5 and 7 months). But sometimes, it's just too much. Watch for signs of intense frustration, anger, giving up, or other signs you read as "I'm done!" Be ready to roll Baby out of Tummy Time if you sense he is done. If Baby is new to tummy time, several shorter times is more important than staying put for long periods. Mix and match different tummy time options. Make it a habit: whenever you put baby down, put him on the floor rather than in seats or standing activity centers. Even propping devices can influence tummy time comfort level! Propping chairs (that hold baby straight up, not the inclined "bouncy seats") and standing activity centers are popular; but propping Baby up in positions she can't yet get into or out of by herself can actually make tummy time more difficult. It challenges proper development of the reflexes Baby needs to rest and play on his tummy. If Baby's body is not yet ready, he will have falls--even very small ones. Then when Baby is on the floor trying to roll, her brain has learned "falling!" and she may reach out her arm to protect herself--and stop herself from rolling. If you have already used propping devices, begin by reducing the amount of time Baby spends in them. Truly, one of the best things we grown-ups can do for our babies is to bring ourselves down to their level. As a society, we tend to lovingly try to bring them up to ours—to prop them up in sitting or standing so they can be up higher and look around. But! That desire to get up higher is part of Baby’s motivation to learn how, from lying on the floor, to incrementally raise her head, push up on her hands, sit independently, crawl, and pull up to stand and walk. If she’s not doing these milestones by herself already, then she’s gaining a lot of valuable experience by continuing to play at her natural level (if she’s developing in a typical manner).